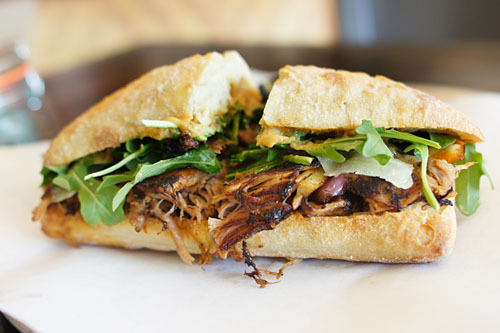 LA's newest sandwich shop is the work of a longtime kevinEats reader: New York native Collier Ulrich, who moved here from Colorado (where he went to college) in April 2008. I first met Ulrich during a dinner at WP24 atop the Ritz-Carlton two years ago. There, he told me about his grand plans for Marcona, a gourmet sandwich shop inspired by the East Coast delis of his childhood. 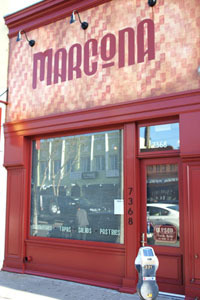 The eatery was supposed to debut in 2011, but not surprisingly for the restaurant biz, the opening was pushed back multiple times, with Marcona finally bowing in March this year. Ulrich himself is no cook, so to craft the menu of Cal-Med inspired sammies, he brought on his friend Matthew Moss to serve as Consulting Chef. The Chicago-born Moss started his culinary career at age 15, when he began working at Pop's Italian Beef. This was followed up by a stint at Fox's Beverly Restaurant & Pizza and formal education at the Cooking and Hospitality Institute of Chicago. Following graduation from CHIC, he traveled to Europe to train, then returned to his hometown. Moss cooked at a number of restaurants in Chicago, including the recently-shuttered Crofton on Wells, as well as Butter, Ohba, and Park 52. In February 2009, he became Executive Chef at District Bar, but would leave there the following year. Most recently, he consulted on the opening of Bomba Tacos in Chicago, which debuted in May 2011. Since then, the Chef's been hard at work at Marcona. Moss, however, is slated to depart Marcona by the end of April, returning to Chicago to start a high-end seafood distribution company. 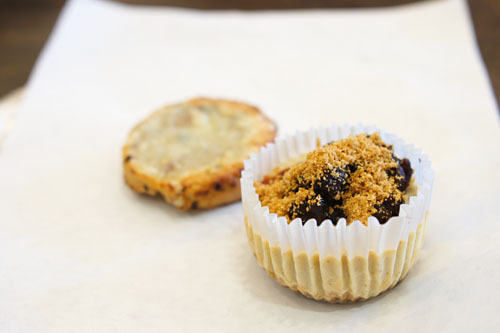 Once he decamps, the kitchen will be run by Janna Leone, who currently serves as Marcona's Pastry Chef. Leone, a Hollywood native, most recently worked in the pastry department at the noted Telepan restaurant in New York. Marcona's narrow, yet bright space exudes an understated appeal, with a touch of New York and some European flair as well. Walls are lined with goods available for retail sale, with many of the items made in-house. Note: the photo was taken during closing time, hence the empty room and guy mopping the floor! 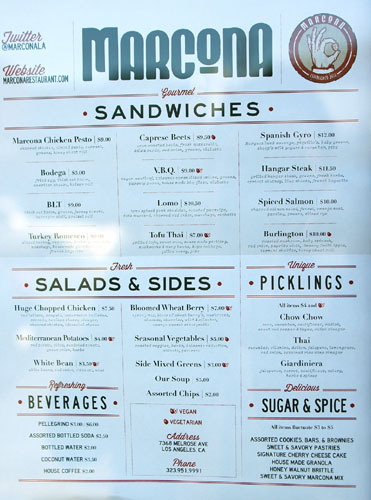 The sandwiches, a dozen or so, are clearly the focal point of the menu, but are joined by a small array of sides and salads, as well as desserts from Chef Leone. Note the wide array of vegetarian and vegan options. Click for a larger version. We started off strong with the Lomo, which showed off tender, slightly spicy portions of pork shoulder, nicely paired with the savory flair of the Manchego and parsnips. Onion and arugula, meanwhile, contributed a counterbalancing flavor to things, and I appreciated the overarching tanginess from the date mustard as well. 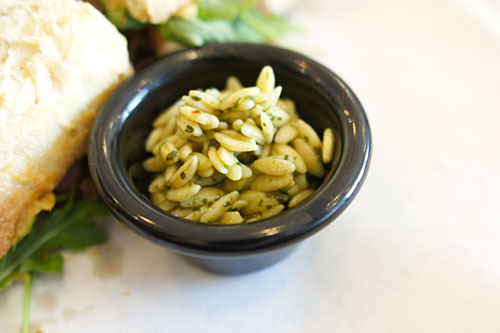 In addition, the sandwich came accompanied by a refreshing vegan side of housemade orzo pasta dressed with salsa verde. 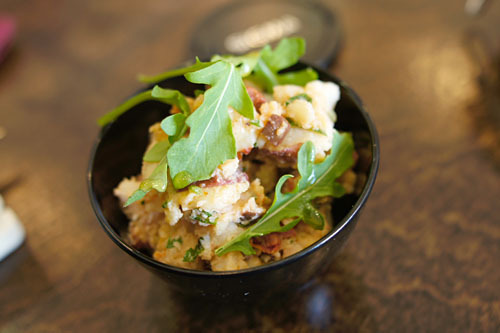 Here was a Mediterranean take on the classic potato salad, with the heartiness of the potatoes deftly augmented by the tanginess of the olive, all while onion and arugula added further points of piquancy to the side dish. 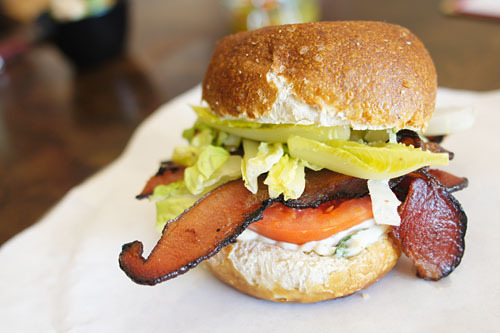 Marcona's BLT was probably the best version of the sandwich that I'd ever had. The bacon, with its savory, spicy character, was clearly the star of the show here, and also conveyed a crisp, yet supple consistency that I enjoyed. Its potency was then beautifully tempered by the veggies, and I appreciated how the aioli sort of tied everything together. I also loved the use of a pretzel roll. 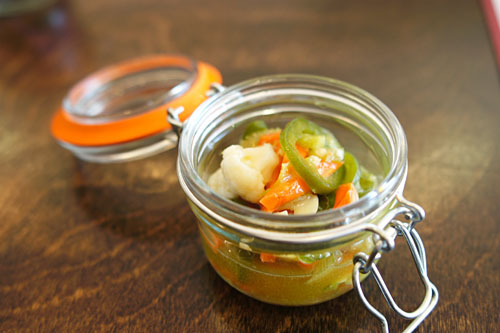 Next up, a jar of homemade giardiniera, or Italian pickles. It was just as I expected, with crisp, acerbic veggies accented by a light touch of heat from the jalapeños, all combined with what I believe was a mixture of vinegar and olive oil. The Turkey Romesco was another highlight of the meal. The bird itself I found tender and moist, with a delicate taste beautifully enhanced by the tart, subtly spicy richness of the romesco. That combination melded perfectly with the crisp, refreshing veggies here, making for a very balanced sandwich overall. 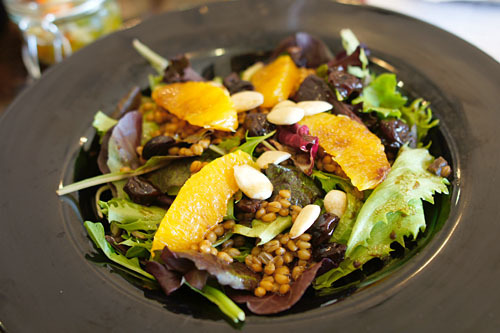 A wheatberry salad was surprisingly satisfying for being vegan. The mixed greens here provided a fitting, bitter base to the dish, but this was nicely counteracted by the sweetness of the fruit, while the vinaigrette helped to integrate everything. The actual wheat berries, meanwhile, added weight and body to the salad, and I also appreciated the nutty crunch of the almonds as well. 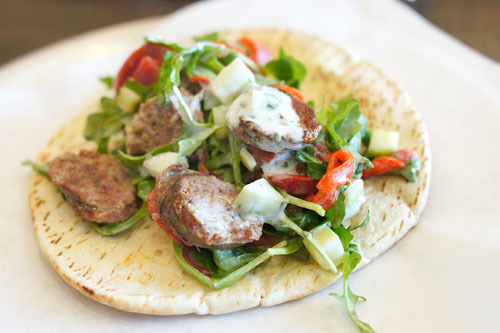 A gyro sandwich of Merguez sausage was delightful as well. I loved the sheer meatiness of the lamb, as well as its focused bit of heat. The combination of piquillo and cucumber did a great job in moderating the gravity of the sausage, and I enjoyed how the cool, creamy yogurt just served to harmonize everything. 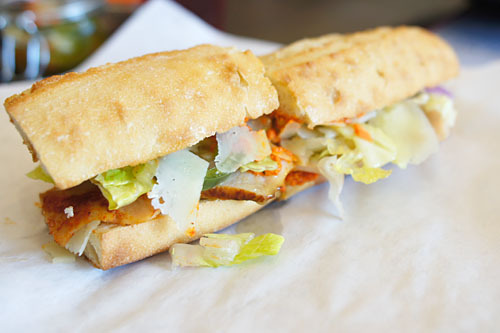 Our last sandwich was the Tofu Thai, which happens to be vegan. The tofu itself didn't have too much character, but went very well with the light, bright crunch of the various veggies at play here. I particularly appreciated the incorporation of wood ear mushroom into the mix. 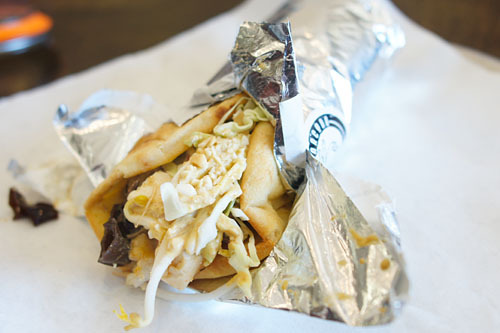 The key, though, was the wrap's sweet, nutty sauce, which provided a unifying force that made everything work. We concluded with some of Janna Leone's desserts. The cheesecake was probably the smallest I've seen, but was nonetheless rather tasty, with the rich, dense cake playing off the tart, sweet cherry admirably; I especially enjoyed the cinnamon-y spice from the crust. I also tried a brown sugar scone topped with cheddar, which conveyed a nice bit of fruitiness from currant, balanced by the savory kick of bacon. 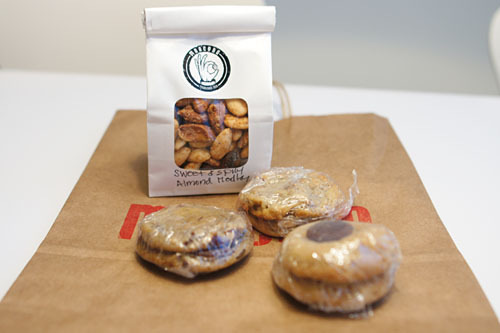 Some treats to take home: Sweet & Savory Marcona Mix and a trio of cookies: white chocolate-walnut, 61% chocolate chip, and peanut butter-chocolate kisses. From reader to restaurateur, that's the story of Collier Ulrich now. He's done a pretty nice job with the place. I'm not much of a sandwich guy, but I did enjoy everything that I ate. Flavors were on point, more complex and multifaceted than what you'd typically find, and I appreciated the variety and depth of the selection; vegans and vegetarians should find themselves accommodated well. In the end, if I lived in the area, I could definitely see myself coming here regularly. A sandwich shop. That's what my new place of residence needs. I just had one, and that was the BEST BLT i have ever had also.... thanks for the tip, Kevin! Anon: Word. It's really the bacon that stands out as the hero there. We moved to Jarnac, a rural town of 5000 near Cognac. I miss a good meatball or spicy Italian sausage sandwich once in a while. Ah, I see. I guess my perception of all French food being of high quality has been shattered! Speaking of meatball sandwiches, Marcona started doing a meatball parm hero with a spicy tomato sauce, similar to arrabiata. Had it the other day, was really good!! 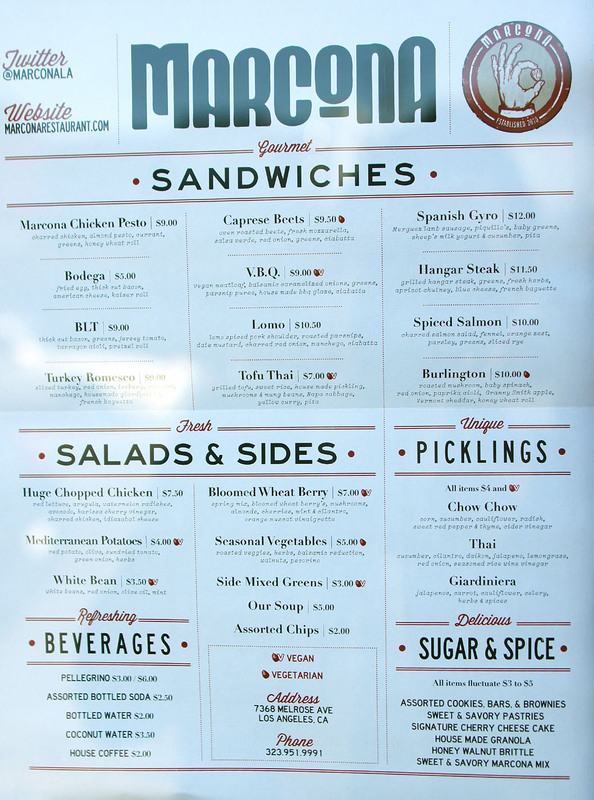 I imagine that the meatball hero is perhaps Marcona's attempt at more "approachable" fare.